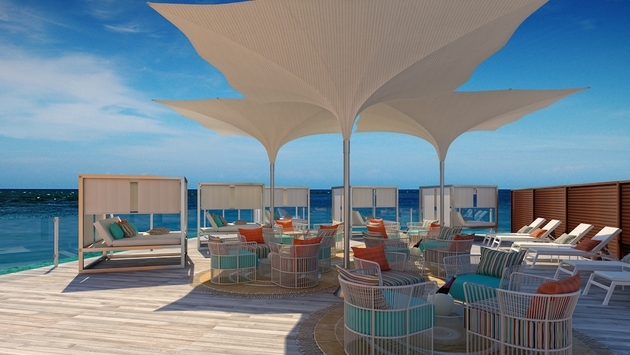 Debuting this fall, the limitless all-inclusive, adults-only Sonesta Ocean Point Resort, will be the premier five-star, all-suite property in St. Maarten. To celebrate the inauguration, this new ultra-luxurious yet sustainable resort is offering a special 35 percent off rates on pre-opening bookings made by Nov. 15, 2014 for travel from Dec. 1, 2014 through Dec. 24, 2015. Rates for Sonesta Ocean Point Resort pre-opening promotion start at $211 per person, based on double occupancy. Guests should use PROMO CODE: OPENEBB when booking directly with the hotel. Exclusive to Sonesta Ocean Point guests, the resort features three pools including The Edge infinity pool with private beach on the cliff, Swim Out pool connected to its namesake suites, and The Point Pool; three bars and lounges including the Sunset Lounge & Bar, Azul Rooftop Bar for private functions, and the contemporary lobby café and bar Martin’s; the Mediterranean-influenced Azul restaurant; an in-resort flagship Wanderlista Boutique featuring carefully-curated resort wear and accessories from around the world; and other resort exclusivities and amenities on offer such as 24-hour room service, intimate gazebos, private cabanas, dedicated open air wellness area and an on property organic garden. For more information on Sonesta Ocean Point, call 1 800-SONESTA (1-800-766-3782) or the resort’s direct number 1-721-545-3100 or visit www.sonesta.com/oceanpoint. Follow @oceanpointsxm on Twitter, on Facebook/Sonesta Ocean Point Resort and on Instagram @oceanpointresort.